You know not to expect much in the way of recipes from me. But when I find something that’s really good, I want to share it with my friends and family who are as busy as I am, some of you busier! Slow Cooker Garlic Pork Roast is absolutely the easiest crock pot recipe I’ve ever encountered, and delicious! We’ve made this twice now at the Garner’s, and each time it’s been so good that Number One Son will just open the fridge door, pull the plate out (the leftovers I’d planned to use in white chili one time and enchiladas the other time) and eat it. Cold. Just imagine the same plate of tender pork roast warm from the crock pot with green beans and roasted red potatoes! I subscribe by email to Kalyn’s Kitchen, she has a South Beach friendly (low glycemic) food blog and of the very few recipes I’ve posted, I think most are from her blog. Kalyn has branched out to include a crock pot friendly food blog called Slow Cooker from Scratch. This blog often highlights slow cooker recipes from other food bloggers in this case a blog called From Scratch to Plate. All three of these are good blogs, and helpful for someone like me who is really busy, trying to eat at home, seeking easy recipes that are economical, healthy and don’t use a lot of processed foods. 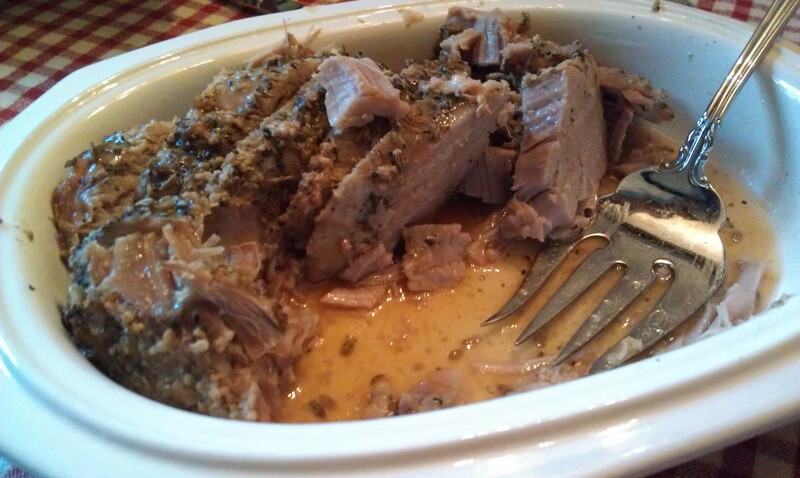 Here is a link to the recipe post: Slow Cooker Garlic Pork Roast. May 5, 2012 The GarnersWhat's Cooking? This is my favorite as well, and I’ve been known to snitch some out of the fridge cold. It’s amazing that something so easy is soooo tasty, and versatile! Thanks for the post! So glad you enjoyed it; thanks for the shout out!